Over at the BBC, the myth about banana flavoring has been put to the test. And while there's a kernel of truth to the idea that fake banana resembles a variety that nearly went extinct, it's still a just a myth. At the BBC, Chris Baraniuk has an article on the always-interesting topic of artificial flavors. Among all the information on the scientific tricks used to make food taste like other foods, there's a bit about fake banana that's particularly novel. On the scale of "tastes like the real thing" to "who on Earth could confuse the two?," banana-flavored treats usually anchor the latter end. In its defense, a myth has sprung up that artificial banana is based on the pungent Gros Michel banana, which was nearly wiped out by the Fusarium oxysporum fungus in the 20th century. The replacement banana, the Cavendish, was resistant to the fungus, but had a different taste. So the disconnect between the artificial banana and the grocery store variety is supposedly due to the flavoring being based on the now-unavailable Gros Michel. "It sounds very, very unlikely to me," says synthetic organic chemist Derek Lowe. "The thing is, banana can be mimicked most of the way with a simple compound called isoamyl acetate. Many chemists know it as 'banana ester' and anyone who smells it immediately goes, 'banana!' 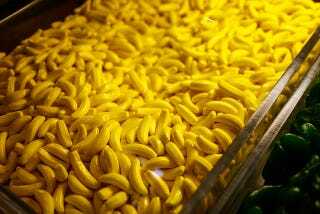 "
Isoamyl acetate, which is indeed found in bananas, is a very simple compound that is both cheap to produce and highly versatile. Diluted, it smells more like pears than bananas and logical combinations of this ester have proved popular. Rob Guzman, a Hawaiian banana farmer, has a suggestion. He produces 35 different varieties – including the Gros Michel. It's one of his top three favourite bananas and he says it has a very distinctive flavour. "It's almost like what a Cavendish would taste like but sort of amplified, sweeter and, yeah, somehow artificial. Like how grape flavoured bubble-gum differs from an actual grape," he explains. "When I first tasted it, it made me think of banana flavourings." So while it doesn't necessarily make sense to argue that banana flavourings "came from" the Gros Michel, the Gros Michel does appear to taste quite artificial. This ties in with analysis of its biochemical properties. Back in the 1960s, for example, the Gros Michel was compared to the Valery, a cultivar of the Cavendish subgroup. "A fuller and more interesting flavour was associated with the Valery fruit," notes one text on the matter. "Confirmation by gas chromatographic studies showed fewer compounds and less volatile components for the Gros Michel compared to the Valery fruit." This hints that the Gros Michel does indeed have a biochemical profile that tallies with the idea of a more monotonous, less complex flavour. So perhaps there is some truth in the banana flavouring whodunnit after all. Once upon a time, banana flavourings really did taste more like the real thing. Read more about artificial flavors, including how color is as important as actual taste, at the full article.